8 oz / 237 g – or Travel Size 0.5 oz / 15 g.
(* = Certified Organic) Ingredients: *Aloe Barbadensis (Aloe Vera) Leaf Juice, Cocos nucifera (Coconut) Oil, *Unrefined Theobroma Cacao (Cocoa) Seed Butter, *Unrefined Mangifera indica (Mango) Seed Butter, *Unrefined Butyrospermum parkii (Shea) Shea Butter, *Prunus avium (Cherry) Kernel Oil, *Persea gratissima (Avocado) Oil , *Olea europaea (Olive) Fruit Oil, Cetearyl Olivate and Sorbitan Olivate (Natural Olive Oil Emulsifier), Tocopherol (Pure Vitamin E), *Ocimum basilicum (Basil) Oil, Mentha piperita (Peppermint) Oil, Rosmarinus officinalis (Rosemary) Essential Oil and Natural Antioxidant Preservative (Antioxidant fruits, berries, and tea tree). 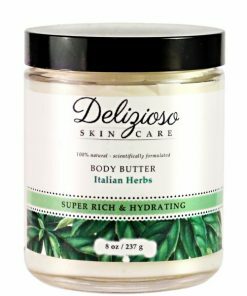 UNREFINED COCOA BUTTER: Not only iscocoa butter high in antioxidants, which fight free radicals, it is also very high in fatty acids, helping to deeply hydrate skin. Cocoa butter is an occlusive emollient, acting as a barrier preventing moisture loss. Cocoa butter is also known to help stretch marks. 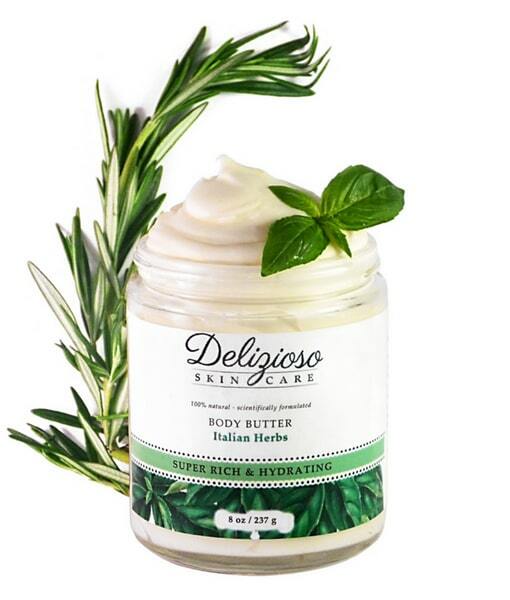 We use only unrefined butter, meaning it’s not chemically de-colorized or de-odorized . (* = Certified Organic) *Aloe Barbadensis (Aloe Vera) Leaf Juice, Cocos nucifera (Coconut) Oil, *Unrefined Theobroma Cacao (Cocoa) Seed Butter, *Unrefined Mangifera indica (Mango) Seed Butter, *Unrefined Butyrospermum parkii (Shea) Shea Butter, *Prunus avium (Cherry) Kernel Oil, *Persea gratissima (Avocado) Oil , *Olea europaea (Olive) Fruit Oil, Cetearyl Olivate and Sorbitan Olivate (Natural Olive Oil Emulsifier), Tocopherol (Pure Vitamin E), *Ocimum basilicum (Basil) Oil, Mentha piperita (Peppermint) Oil, Rosmarinus officinalis (Rosemary) Essential Oil and Natural Antioxidant Preservative (Antioxidant fruits, berries, and tea tree). 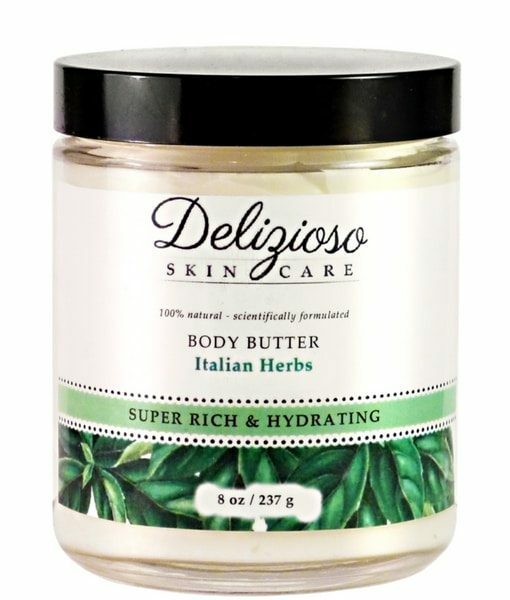 This was the first body butter I’ve ever tried and don’t intend on buying another brand. My skin was left so soft and supple with a delicate scent. I look forward to trying this in every scent available with time, because (wow!) does this last for a decent amount of time. I can’t wait to buy more!